My last letter was not about an isolated and sad childhood; it was the opposite. If you were anyone other than my mother, you would have read it as a gloating exultation rather than a series of grievances. I was boasting about my frequent practice with creativity and industrious nature, about finding comfort with being alone, about filling up on close friends. These things have carried me into “adulthood” or whatever. I was often alone, but I never really struggled with loneliness. I learned how to cope. I chose to go to summer camp, to ready my trundle bed so that my bedroom could instantaneously flip into a hostel, to pick up the phone on the rare occasion when I was home alone. 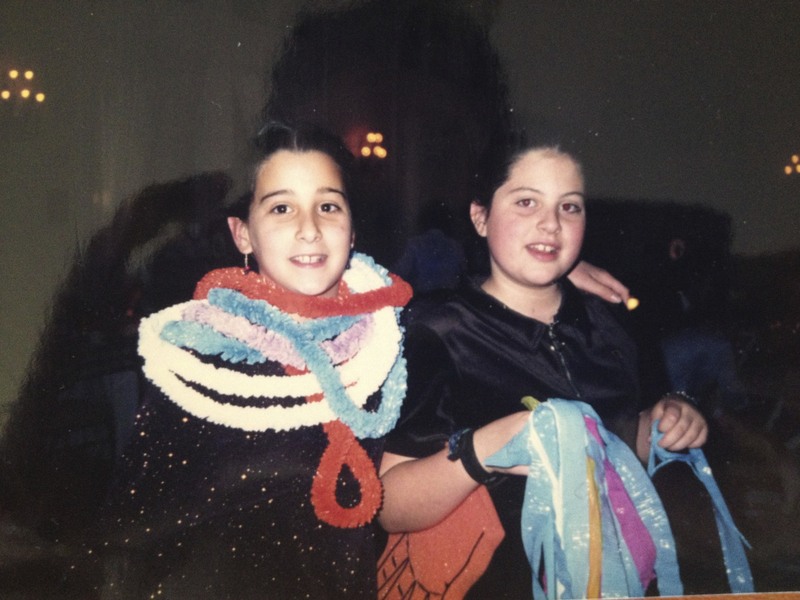 I feel proud about the aftermath of my only-childness, not sad. You should too. Regarding your cluelessness, it would be weird if you knew everything about my life. Really weird, trust me. But you don’t remember me playing in the kitchen? 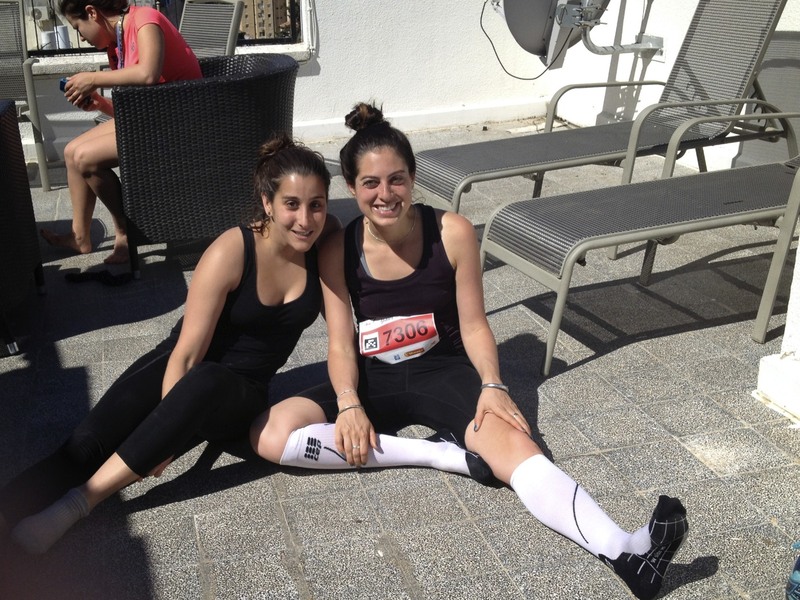 Naomi came from Haifa to Jerusalem last weekend and we ran the Jerusalem half-marathon and prepared for the Birmingham-in-Israel Shabbat dinner together. When we got home from dinner on Thursday night, we discussed what we’d do next. Go to a bar? No. Let’s bake. The only baking ingredients I had were weird grains — no butter, sugar or eggs in the fridge. But we got creative. I sliced eggplant for the star dish of the next evening’s meal and Naomi whipped together cookies made out of rye flour, yogurt, cinnamon, honey, oats, coconut oil and chopped figs. As we worked in the kitchen, we talked about how we used to go through your pantry and bake without recipes when we had nothing else to do. Surprise concoctions… it was a common activity for us. How do you not remember? Memory is a funny thing. You probably blocked out my invasion (destruction?) of your sacred kitchen space to keep your sanity. I don’t blame you. Do you at least remember the witches game I played with my cousins? We baked mud pies and brewed dirt potions until you caught us dragging sludge through the house. You furiously hosed us down like dogs and banned us from playing witches again — traumatic for both parties. You’re absolutely right, the grass has brown spots on both sides … what to do but turn it into green ice cream? I’ll be home for Passover in less than a week! I know it’s your kitchen and you can do whatever you want in it, but please have the gefilte fish situation under control. Thanks. Your parents-of-Birmingham-in-Israel Shabbat dinner looked like a lot of fun and ours was too. 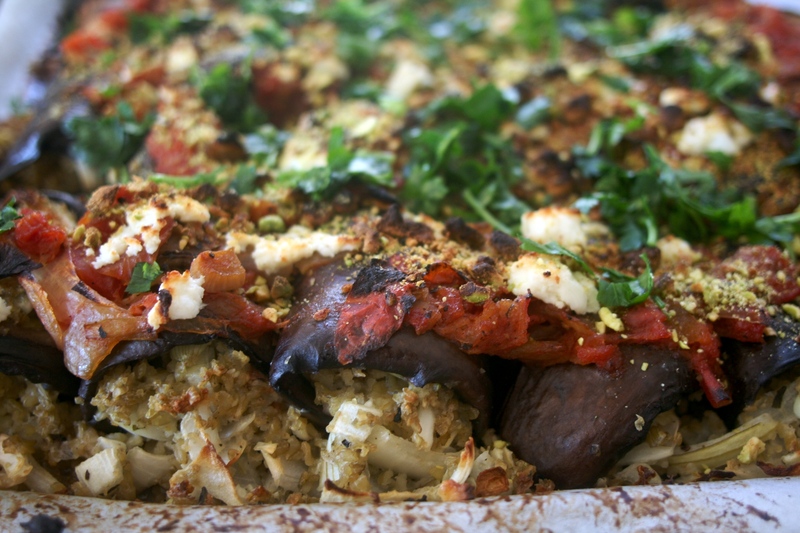 I made my own version of this recipe from one of my favorite sites, Green Kitchen Stories. I veered from their Italian spices and went East, substituting freekeh (smoked green wheat, popular in Arab grain dishes) for bulgar and cumin for basil. The recipe seems like a lot of work, but I did it in stages so the final prep was quick. I made the stuffing and tomato sauce a week before and kept it in the freezer until I was ready to use it. 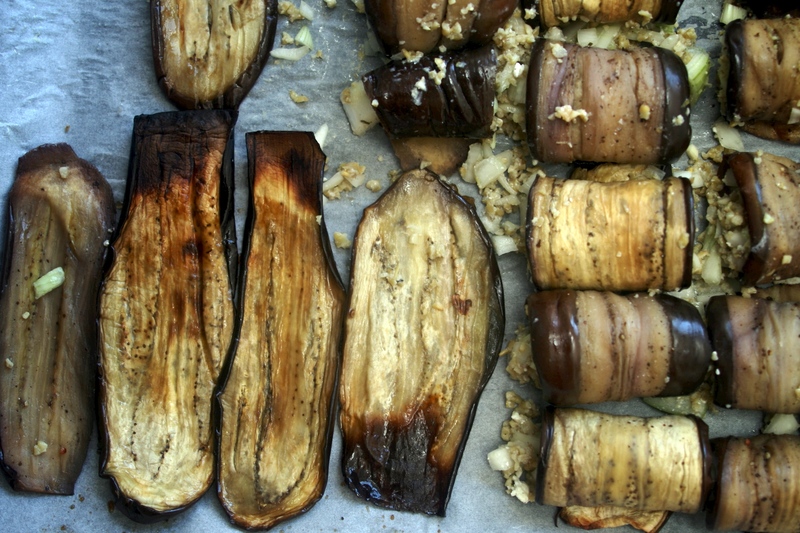 I sliced and roasted the eggplant on Thursday night. On Friday, all I had to do was assemble and bake. The pictures certainly didn’t come out as nice as these, but it was still pretty. And it tasted delicious. 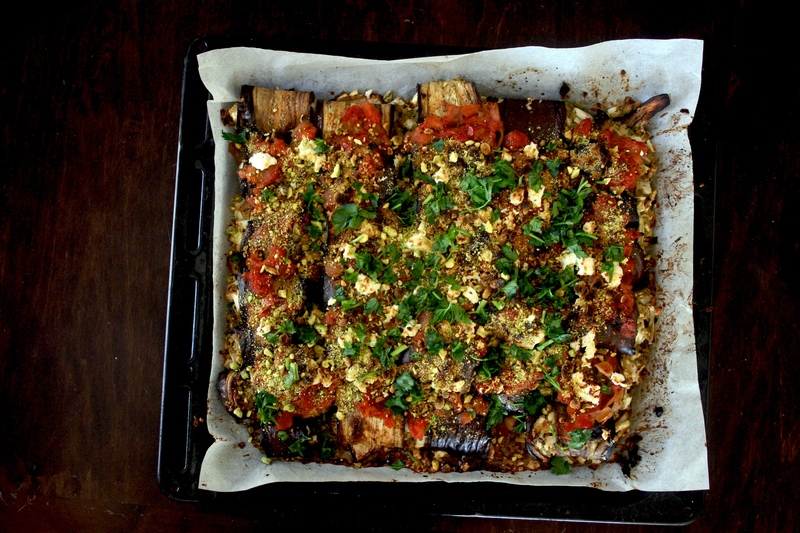 Thinly slice the eggplant lengthwise and coat with a thin layer of olive oil. 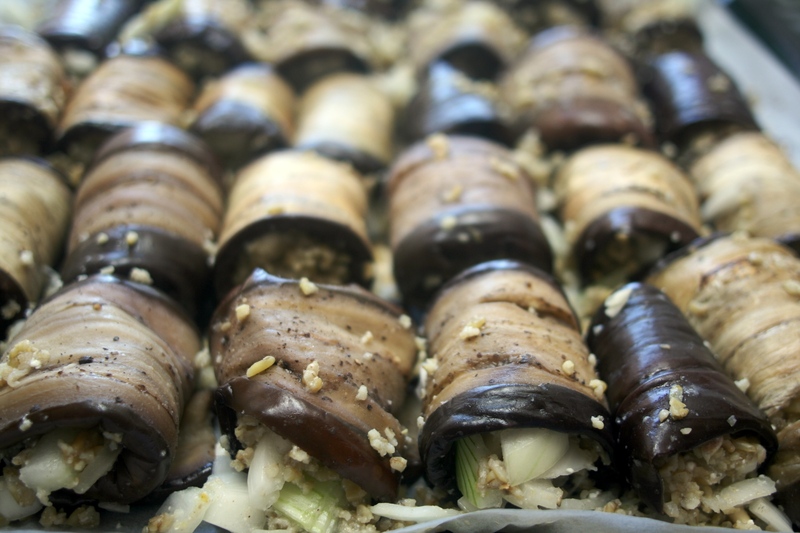 Sprinkle with salt and pepper and roast in the oven on 400 F until browned on the edges (be careful – these are very easy to burn and they will not roll nicely if they’re too crisp!). Remember that you will bake them again, so don’t worry about getting them a perfect golden brown. Heat the olive oil in a pan, add cumin seeds and stir until fragrant. Add onion, garlic and chili. Stir until onions are translucent and then add canned tomatoes, lemon, salt and pepper. Simmer for 20 minutes. Cook the freekeh according to the recipe on the box. Add remaining ingredients. Add the egg, use your hands to gently fold the ingredients together without mixing too much. Line a baking sheet with parchment paper and brush with oil. 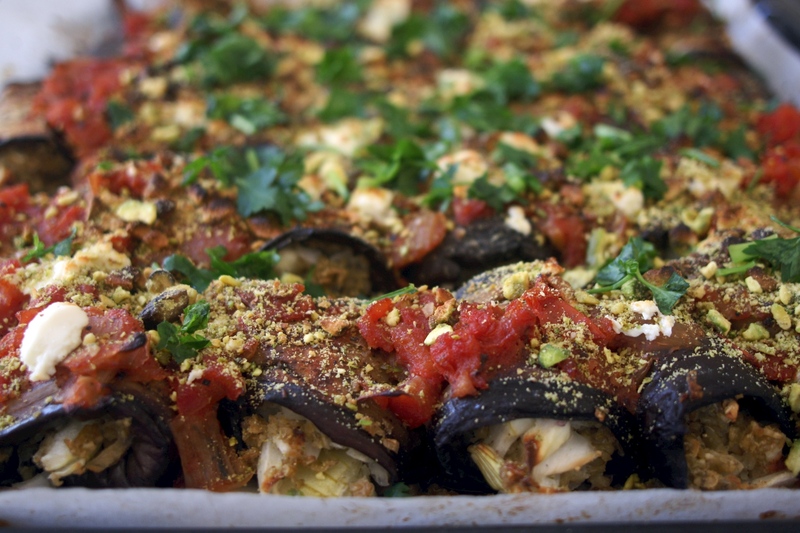 Preheat oven to 325 F. Lay the eggplant slices on the baking sheet and place two big spoonfuls of stuffing at the bottom of each. 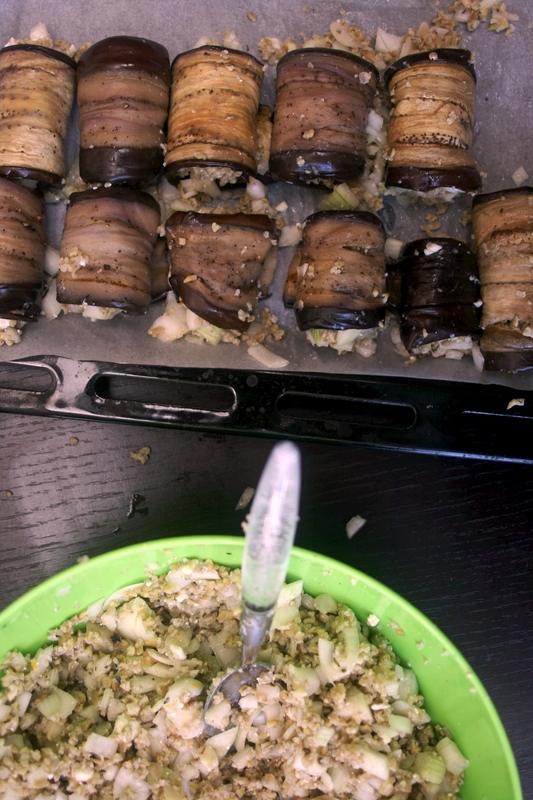 Roll the stuffing into the eggplant lengthwise away from you (this takes practice and patience!). Once they are all rolled and sitting next to each other, cover them with the tomato sauce. 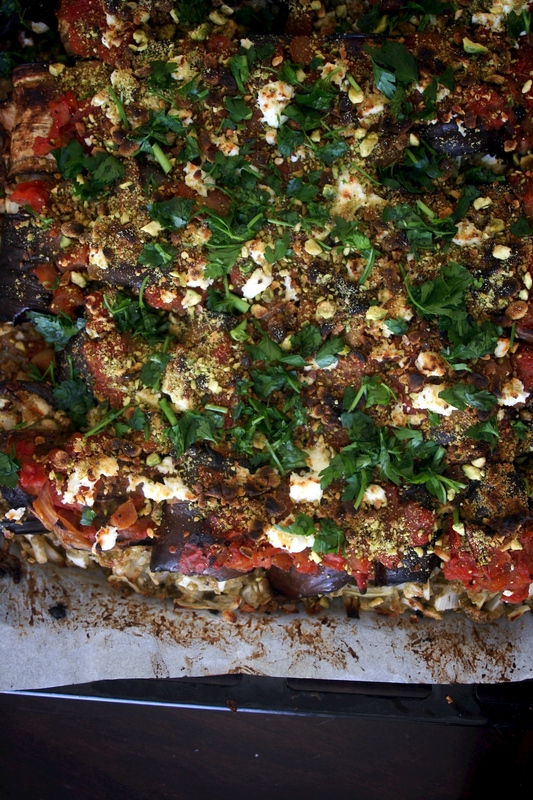 Bake for 30 minutes at 325 F. Remove from oven, sprinkle with goat cheese, and place back into oven for 12-15 minutes, until goat cheese is melted and browned. 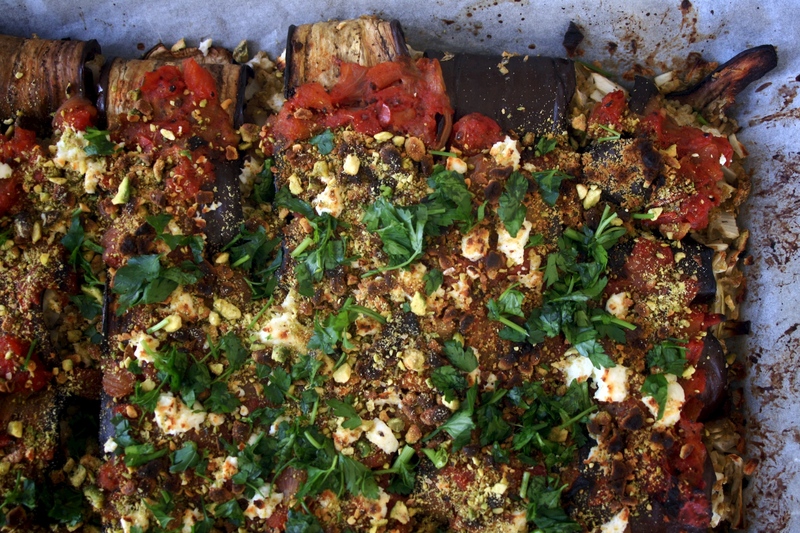 Remove from oven and let rest at least 15 minutes. 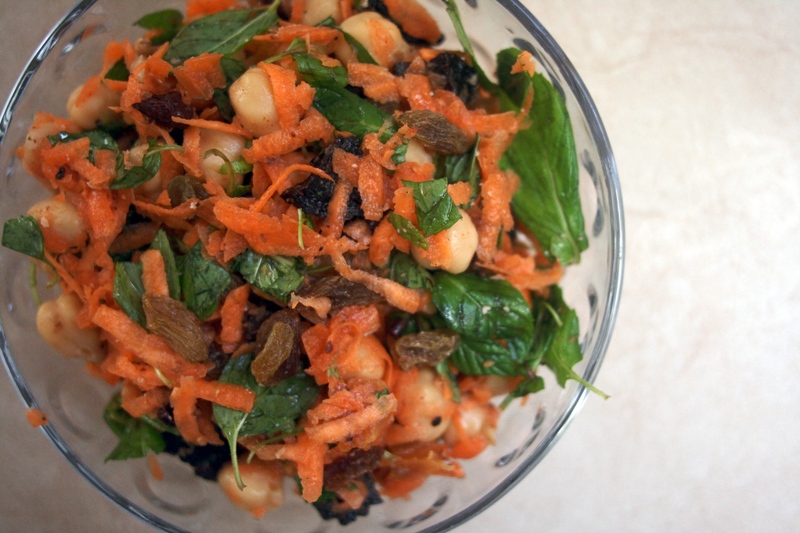 Sprinkle with pistachio nuts, olive oil and chopped parsley before serving. 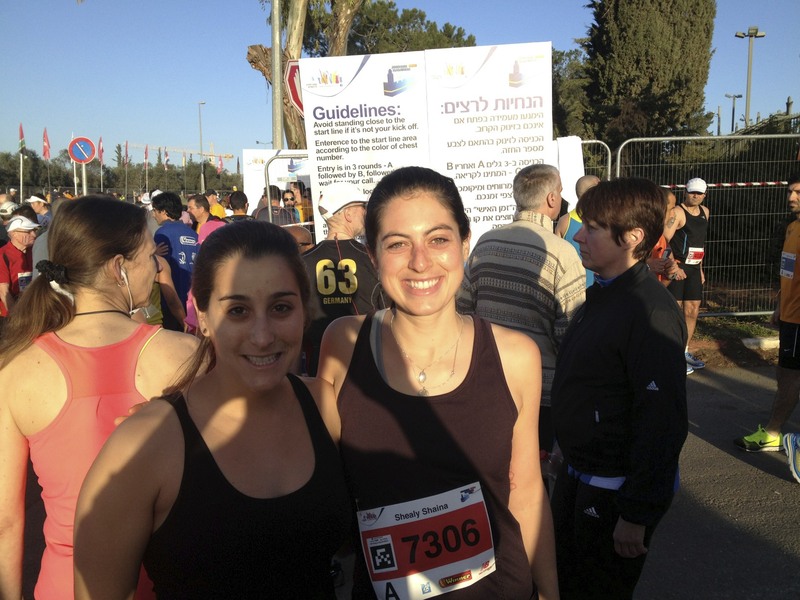 I love that we coordinated some of our recipes to be the same in Birmingham and in Israel. 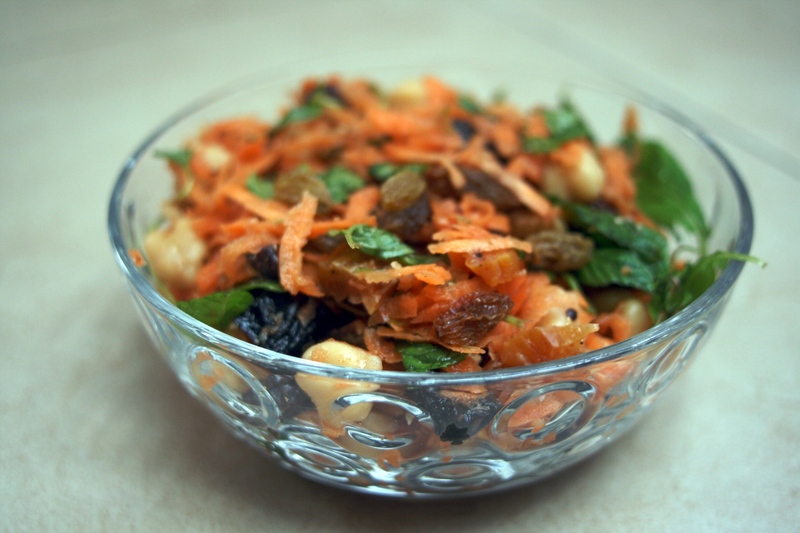 Naomi made her famous carrot salad, which you enjoyed via Gail on the other side. I made my own version inspired by hers and one from 101cookbooks.com. 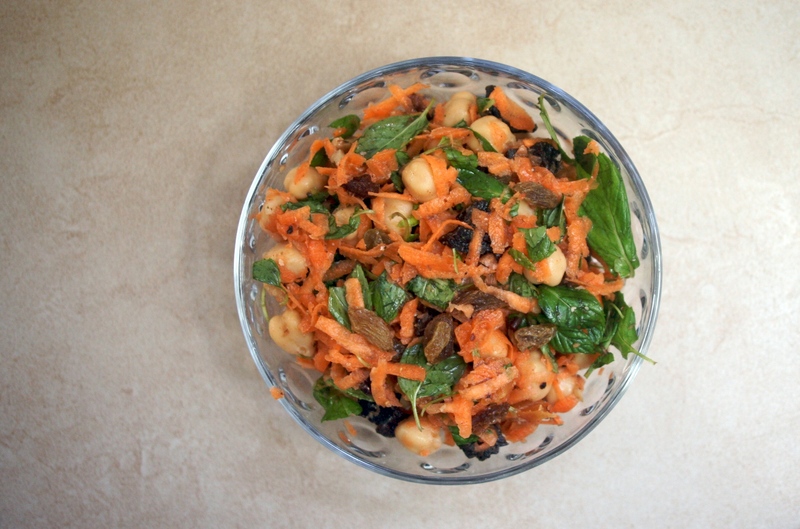 The added chickpeas make it a bit hardier than Naomi’s just-carrot salad – it’s a perfect lunch on a busy school day. 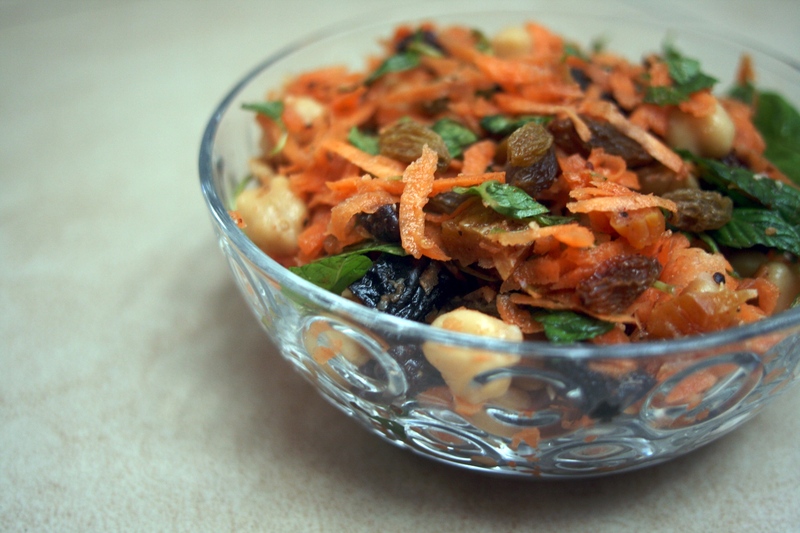 Shred carrots into a large bowl, pour dressing over and let sit an hour or more to let flavors come together. Add toasted nuts before serving. I like the same poses over time photos.